The room was full of moon shadows and dancing light. But it was the wall around the window that Lucy couldn't stop staring at, the one with the painting of Spring. It was as bright as a sunny day and the tiny yellow flowers that covered the fields were moving, as if a breeze had blown through the painting and set all the petals dancing. Lucy McKenzie can walk through walls. Sent to stay with her Aunt Big in a hidden valley, Lucy discovers the old house is full of mysteries. One hot night, she hears a voice calling from inside a painting on the dining-room wall. This beautifully written book, The Four Seasons of Lucy McKenzie, about a girl who could walk through walls, builds gradually from its straightforward beginnings until the reader is both hooked into the story and totally enchanted. Each of the characters grow and shine in such a way that you feel as if you are there with them at Avendale, a part of their story and totally wrapped up in finding out what will happen next! Kirsty Murray has crafted the story carefully, using rich language and vivid descriptions to bring the world of Avendale to life, as eleven year old Lucy McKenzie is sent to stay with her great aunt in the isolated old family home, deep in the bush. Her older sister has had an accident and her mother has to travel to Paris to look after her, while her father has to work. All Lucy wants to do is leave her grumpy aunt's house and go home for Christmas - until she discovers the magic in the paintings on the wall of dining room. Journeying through to another time, meeting new friends and sharing adventures with them gives Lucy a new found confidence in herself, a better understanding of her aunt and the rest of her family, and a deep love of Avendale and all it means to them. As well as telling a heart -warming and exciting story, The Four Seasons of Lucy McKenzie provides a realistic insight into what it is like to live in the Australian bush, alongside the threat of bushfire and flood - and cranky wombats – as well as introducing snippets of history, both as events that have happened and as life and attitudes in the past. This would be a great book to read with a Year 4 or 5 class, with many launching points for discussion on such topics as family relationships, friendship, bush safety, fire preparedness, lifesaving skills, believing in yourself and reaching for your dreams. Plus it is a great adventure. Magic! 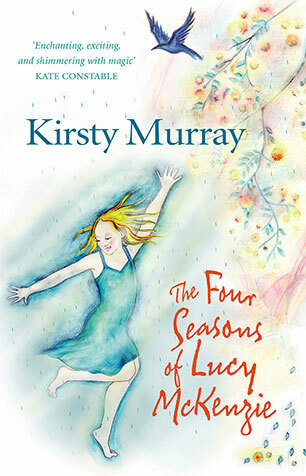 The Four Seasons of Lucy McKenzie, by Kirsty Murray follows the adventures of a young Australian girl who is staying in a remote valley with her great aunt, Big. Lucy has discovered a portal to the past in which she and Big are friends and she experiences life changing moments and her family’s history. This easy read, contains the concepts of time travel, family history, remoteness, natural disasters. It identifies the importance of recognising that the events of the past impact on who we are, but do not define your future. The Four Seasons of Lucy McKenzie compliments movies such as The Time Travellers Wife or maybe Lost in Austin, in order to explore the representations of time travel and provide a platform for creative writing. Lucy does not manage to change history, to her preferred outcomes, despite trying and students could re-write part of the novel exploring what the differences may have been for Big if her brother Tom had lived. The novel provides a strong basis for researching family history and interviewing relatives to tell their stories, a multimedia approach to this using film to interview older relatives would be great, followed by reflective writing on the life journey and the choices that have been made. Students could also explore the role of natural disasters and the impact they have on changing lives and people’s choices and how they view both past and present, this is supported by education kit http://www.acmi.net.au/global/docs/living_with_disaster_education_kit.pdf which is published by the Australian Government -Attorney-General’s Department. This book would appeal to girls in an early high school setting. Four a half stars. Maybe four and three quarters. I dithered about this for a while and almost gave it five stars. It is a delightfully engrossing story. When her big sister Claire is involved in a serious accident in Paris and her mother flies over there to be with her, Lucy is sent to stay with Aunt Big. Lucy is not a bit happy about the situation initially and finds aunt Big abrupt and grumpy. One room in Aunt Big’s house becomes a portal into another time where Lucy meets April, Tom, Jimmy Tiger and another Lucy usually known as Lulu. She has fun escapades and also encounters danger. The story contains vivid depiction of the Australian bush and its inhabitants. You can almost smell the eucalypts. It is beautifully written in poetic prose but without sacrificing the elements of story. It all fits together. I also liked the way it brought in other books and stories that Lucy had read. This is a great time slip story with very likeable, true to life characters. At the time of reading I was also reading two other books, not written for children. This was far more enjoyable than either of those two books and was the one that drew me back to it. Girls in particular around 9-12 will no doubt adore this book .Teachers will find it useful to involve classes in lessons of history, natural disasters like bushfires and floods, family relationships, friendship and use of imagination. I can’t recommend this story highly enough. My one reservation was the illustrations. While the colours of the cover are beautiful, I found the faces of the human characters very off-putting and the same with the faces in the couple of black and white illustrations in the book. That is a minor quibble in what is a magical story. I must confess that I love a good time slip novel. I think it stems from my reading of Tom’s Midnight Garden as a child. Couple this with the excellent writing of Kirsty Murray and you have a winner. Well, that about sums it up – loved it, loved it, loved it! But, I guess sixty words doesn’t pass for much of a review, and to try to do this lovely book some justice I will expand a little. Lucy McKenzie is experiencing a family crisis. Her beloved sister Claire has sustained a serious injury after a fall. She is alone in Paris and her mother has rushed to her side. Lucy’s father has work in Queensland and can’t look after her, so there’s nothing for it but to leave Lucy with the ancient and rather brusque Aunty ‘Big’, who lives on an isolated property and spends much of her time painting. For Lucy, this seems like a terrible solution, but what can she do? ‘Big’ lives in the old family property, where much of the artwork in the house was painted by her artist father or ‘Big’, including the dining room which had become the canvass for a vast mural depicting the landscape surrounding the property over four seasons. As you can imagine, these paintings become the gateway through which Lucy will pass, and which connect her to the landscape, her family history, and back to the present. The use of art as a medium of travel to another world or time is not a new idea – think Voyage of the Dawn Treader or Mary Poppins, but the treatment of it in this book is charming. Whilst, there was nothing unpredictable in the story, the writing made it a pleasure to read and I was left with a very satisfied feeling. From a teaching perspective, I think this book would make a very interesting story writing prompt. Art can take us to so many places and imaginations can fill in the back story. I wonder how many more amazing stories might be inspired by reading this book? Because of a family emergency, Lucy is sent to stay with her great aunt "Big", an artist who lives in the Australian bush. Lucy has only met Big once or twice before, but not stayed with her, as had her much older siblings when they were younger. This time-slip story tells how Lucy learns what it was like to live on the property in a time just before World War II, and more about her family, including how Big became Big. The writing in this book evokes the Australian landscape, both its beauty and also its dangers. With evocative, lyrical language, Kirsty Murray paints a picture of a young girl, Lucy as she enters a world of bygone days in rural Australia while dealing with modern day problems. With a wonderful sprinkling of similes and metaphors, (“The river was a blue ribbon, weaving its way through the dark bush.”) any of these passages from the story could be used in the classroom to highlight the use of these language features. as well, Lucy has many reflective times where she ponders the future, love and the position in her family. There are many references to classical literature and mythology, so there is scope for extended class research: The Lion, the Witch and the Wardrobe (C.S. Lewis), Alice’s Adventures in Wonderland (Lewis Carroll) and the story of Persephone. While there is a strong sense of history, the modern world of young people is evident with Lucy’s desperation to search for mobile phone reception in the isolated bush of the valley. I really loved the world that Kirsty Murray created for readers and I felt that I was part of this world as the threads of family history were woven through the pages. I did not know how this enthralling tale would end as the author was able to surprise me as I wandered through the seasons and through the land of fire and flood with Lucy and her friends. The four seasons of the title refers to the wonderful paintings on the dining room walls in the old homestead Avendale, which lies in a hidden valley surrounded by bushland in this fast paced, adventurous time slip novel. When Lucy’s big sister, who is studying in Paris is seriously hurt in an accident and her Mother flies over there to be with her, and her Father is unable to care for Lucy as he is starting a new important job, Lucy is sent to stay with Aunt Big at Avendale. Lucy is unhappy with this arrangement and finds Big, prickly and grumpy, Lucy herself is unco-operative and difficult. Things begin to change when Lucy finds the paintings come alive and she can pass through them into the past. Murray draws a realistic picture of the Australian bush in the late 1930s, and here Lucy meets April, Tom and Jimmy Tiger. Wonderful adventures follow and we see Lucy grow from an inward looking, unsure and unadventerous girl into a confident, skilled young person applying the skills she learns in modern times at Avendale to help with fires, floods and loss in the past. This book is quite the page turner and I couldn’t wait to see what would happen next and where every one fitted from past to present. A bonus in this novel is a realistic and often action packed look at some historical events that have shaped Victoria including the Black Friday fires, floods and World War 2. Although this book would suit years 5, 6 & 7, unfortunately the cover and illustrations will hold it back from reaching a wider, larger audience. I think the story would fit with the Year 7 curriculum especially the natural disasters unit and year 7 and even year 8 girls will love the story, it has much to offer them but its presentation will limit its audience. When Lucy McKenzie is sent to stay in a bush valley cottage with her crotchety old aunt, she thinks she’s in for the most boring Christmas holiday ever. While at first she misses her family and is unsure of her surroundings, Lucy soon discovers a secret magic that whisks her away into another time – but a world that is somehow familiar. Lucy meets a young girl called April who is similar enough to be her identical twin. The girls quickly become firm friends. They share secret hideaways, spy on the mischievous Jimmy Tiger and explore the river and the valley. While Lucy doesn’t quite understand the magic that has given her a gateway to this other world, she comes to realize there is a purpose to each adventure and a connection to her new friends that will have consequences in her own life. This charming story mixes magic with realism as Lucy explores the valley with her new-found friends. As childhood adventures make way for more serious encounters with fire and flood, the children must find the courage and capacity to deal with the real-life hazards of living in the Australian bush. This book would be an appropriate novel for students in middle to upper primary classes. The content covers some important moments in Australian history such as the Black Friday bushfires and Australia’s involvement in World War Two. The novel also explores the notion of creativity and compares different family perspectives on valuing the role and importance of the arts. Lucy MacKenzie is staying with her eccentric Aunt Big in a mysterious valley when she makes an even more mysterious discovery about herself. She can walk through walls into another place … or is it another time? In the new world she finds new friends, a girl named April, and boys Jimmy Tiger and Tom, who are excitingly different from anyone she’s ever met and yet strangely familiar. Where has she met these people before- and more importantly, why is she here for them? Lucy finds herself trying to unlock the mystery of the different world, the strange house she’s come to live in and her aunt, in an adventure with a strongly Australian flavour. The Four Seasons of Lucy MacKenzie is a book full of beautifully drawn characters – Lucy is both strong and sympathetic and her Aunt Big curious, funny and increasingly lovable. Lucy makes friends you want to make and continues to visit them as you want to. She makes several trips into her weird new world, each time she seems to have found herself a new “mission” and becomes a proactive heroine you pin your hopes on. The story is sweet with a tinge of sadness for the fate of the characters but ultimately it is a story about friendship, adventure and the ties across family rather than a really challenging story about the complexities of time travel and Lucy is a sympathetic character to enjoy this growing-up and exploration with. I believe this story could be enjoyed by middle and older primary school children and early teenagers. Older teenagers would probably be looking for more complex themes and a more find the dealing with time travel here a little too simplistic for them. The Australian background with the bushland, the bushfire country and the local slang is incorporated neatly to portray a picture of Australian life. It brings up themes of fate and inevitability – Lucy seems to be able to change the destiny of some people in the story, but not all. What do people think about what is set in their lives and what can be changed? If they could go back in time, would they change anything? Or would they think this might disrupt, rather than fix, their future? Younger readers will, I am sure, find this story charming. There is mystery and imagining, adventure, danger and humour. Personally I wanted to love this book because the premise is wonderful. But I don’t. The writing style and some timeline questions have left me unsatisfied. But then, I am not the target age group and couldn’t suspend my disbelief long enough for a fantasy in a real setting. It is however an interesting story and lends itself to all manner of classroom use. Care would need to be taken if it was being used as a class text where young people have suffered loss. The dramatic points include flood, bushfire, war and death. But, because the story criss-crosses the present and the past, it provides some interesting contrasts about technology and societal change. It therefore has some good starting points for classroom writing and discussion. The children in the past have a lot more freedom to roam than the present day children – that reminded me of my own childhood growing up on a farm. 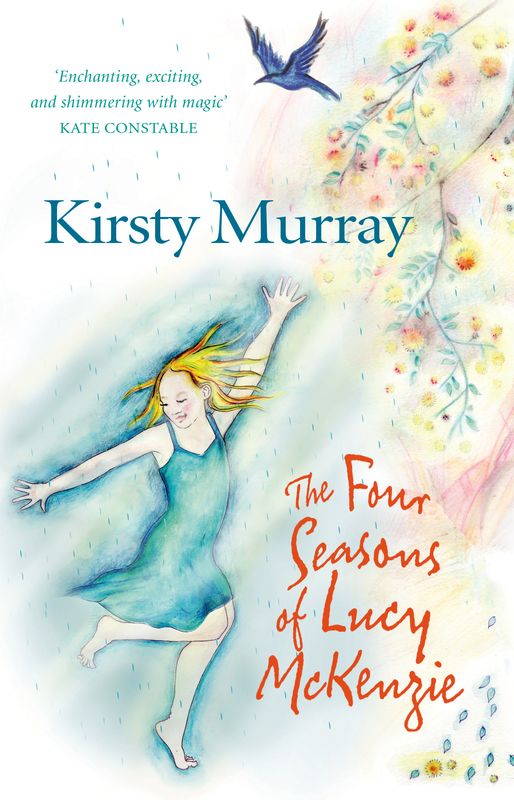 The Four Seasons of Lucy Mackenzie by Kirsty Murray is an adventure novel in which the main character goes on a time traveller journey in the same location but at a previous time. The cover illustration by Florence Boyd invites the reader into Lucy’s world through a beautiful illustration conveying the idea of Lucy travelling through time against a background of changing seasons. Lucy McKenzie’s older sister is in a coma in a hospital in Paris after an accident. Her mother has flown to Paris to be with her and her father has to travel to various mines to work so Lucy is sent to stay with her aunt Big. With only vague memories of her stern aunt who lives in a little old house on her own in a secluded hidden valley, Lucy is expecting her time with her aunt to be miserable. When Lucy arrives and finds there is no phone coverage or internet access she is despondent about the weeks ahead, knowing she will miss her parents and be worried about her sister and be lonely. However, she soon discovers that the old house with its paintings of the four seasons covering the walls in the dining room holds an amazing, magical secret. One hot night she hears a voice calling from inside one of the paintings and soon finds herself walking through the walls into an alternative reality in a world set in the same place in the valley pre WW11. Lucy and the characters she meets are engaging, her adventures are exciting, relationships develop and mysteries are solved. Like pieces in a puzzle her adventures reveal answers to many questions. This is a cleverly crafted time-traveller adventure that will engage readers from start to finish. Readers will step through those walls with Lucy into a different world where beautiful descriptions and changes in the Australian bush through the four seasons provide the setting to Lucy’s adventures. Readers 9 to 13 will enjoy this time traveller book. Lucy’s older sister has had an accident and lies in a coma in a Paris hospital, her mother has gone to Paris to be by her bedside and her father has started a new job and cannot take time off to look after 11 year old Lucy during the summer school holidays, so she is being sent to stay with grumpy old Aunt ‘Big’. Aunt Big lives in an isolated valley, he house “Avendale” is nestled into the bush and is a bit dark and spooky however the dining room is different, the walls have been painted to show the four seasons in the valley, in summer, autumn, winter and spring. Lucy feels that Aunt Big doesn’t really like her that she would much prefer to have Claire or Jack, her older sister and brother visiting, she is very lonely. Lucy is woken during the night by strange noises and wanders into the dining room, where she finds the painting on the ‘spring’ wall glowing and alive, there is a breeze coming from the painting, and she can hear someone calling her name, she looks closely and can see a small figure running through the bush, she must be dreaming. Lucy puts her hands on the painting, there is no wall, and she steps forward into the valley running to catch up with the girl who is calling to her. This must be a dream but it feels so real, Lucy meets a girl, who is about her age, named April, they ride horses, something Lucy has never done, and climb to April’s secret place, they start to become friends, Lucy meets April’s older brother Tom and friend Jimmy Tiger. Back at April and Tom’s home “Avendale” and Lucy realises that this is an “Avendale” from the past, when she walks into the dining room, only it is a bedroom in this time, she places her hands on the wall where the painting of spring will be one day, and suddenly steps through, back to her own time. This is a wonderful time slip story, where Lucy comes to realise that she has a real connection with her Aunt and the past. Her Aunt also discovers a connection with Lucy. It is a story of discovery and adventure with bushfires and floods and the coming war. I would recommend this book to all year 7 and year 8 readers and Teachers. This is a book about art, time travel and relationships. The dining room has four seasons separately painted on the walls whereby our heroine, Lucy, can travel to the past. Her present day skills help save her ancestors and their home from bushfires which threaten in the present as well. Lucy is taken to a hideout where April shows off her paintings. It is this same April who is Lucy's great-aunt Big and we learn how she came by her nickname. Big takes Lucy on her travels painting and teaches her how to row and start the outboard motor. Again, this proves fortuitous. We learn that Big missed out on visiting Paris when she was younger, sailing to England, only to return on the death of a relation. So close. We then have to wait and see if she will ever get to Paris where Lucy's sister, Claire, is recuperating from a fall. A delightful story set in Australia. Themes of art and bushfires could be utilised, looking at the painters mentioned and the Second World War in New Guinea. Though it is a fantasy story, there is enough realism about life in the bush, especially for city slickers. What happened when Big tried to run away from the fire? Why wouldn't Tom listen to Lucy about joining the RAAF? How many times did Lucy go through the paintings? I just love it when authors can find an interesting way to retell historical events and eras for the younger reader. In this novel Lucy McKenzie is sent off to stay with an elderly aunt while her mother flies half way round the world to care for her older sister who is hospitalised, her beloved older brother is overseas and dad is stressed out about the situation and having to continue work. Lucy is extremely reluctant to stay so far from home with a relative she knows so little about… that is until she works through a painted scene on a wall into the past of the farm where she meets three children and has an effect on the unravelling events of the time. As well as being a great look at family relationships it gives the reader a glimpse of an era long gone and a lifestyle that many reminisce about. I am sure the novel could be woven into a unit of work in the primary school but it is a great read in and of itself. When, due to her sister’s accident in Paris, Lucy McKenzie is told she has to stay with her great-aunt “Big”, she rails against having to go. Nonetheless, as her mother flies off overseas, Lucy’s dad drives her off to the country. She finds herself away from her familiar surrounds and beloved technology, staying at Avendale, the old family homestead, deep in the Australian bush. Big seems to be eternally grumpy and aloof and Lucy responds in kind. However, Lucy finally discovers the magic of the paintings of the four seasons on the walls of the dining room. She passes through the wall, emerges in a familiar place but a different time and life becomes more interesting. On meeting a young girl named April, who looks just like her, and the boys Tom and Jimmy Tiger, she finds herself being drawn back into the painting via the murals of the landscape which depict the different seasons. Her experiences in the parallel universe have a major impact on her nature and she grows and changes in her attitudes, abilities and acceptance of her situation. Her new friends and the new setting show her the simplicity of life in a previous era bring the war to life and demonstrate the power of natural disasters which occur in our harsh and varied Australian climate. The activities in which Big involves her have a direct link to the events in the past and it would appear she may have the ability to change the outcomes of her family’s history. Will things end happily or not? Being a Kirsty Murray fan, as well as a time-slip fan since having read Charlotte Sometimes as a child, I loved this book! Some parts I found quite predictable but Murray wove in other bits which I wasn’t expecting and I found it to be a satisfying read. Unfortunately, the cover wasn’t one which held much appeal for me. I suspect there will be many Upper Primary girls who would enjoy the story but would need to overlook the cover in order to pick it up in the first place. The marketing seems to be aimed more at the middle to upper primary students so perhaps this can be overlooked by the younger girls. In terms of the Australian curriculum, there is possibly a place for this title as a historic text, revealing some of the realities of war and showing parts of life “now and then”. I have also worked with an English unit on natural disasters, beginning with Dorothea Mackellar’s My Country and leading in to other text types on fires and floods and this would be a welcome addition to such a unit of work.